Interesting choice of words, if he were to be traded "before Thursday's draft." Perhaps meaning that if there's no takers by then, they'll accept a 2nd. I still think the most sensible trade would be switching 1sts with them. I'm not as high on White as others, I think he projects more like a top end CJ Mosley than Roquon Smith which is the comparison I keep seeing. His tackling technique is highly suspect. I just don't see the fit in a modern NFL defense that already has 2 very talented LBs. If White is still there at 9 I would see what Pittsburgh is willing to give to trade up for him. My only issue with drafting White is nickel defenses are practically base defenses at this point. We're not going to have 3 LBs on the field often enough to take a LB high. 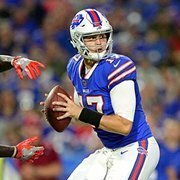 In the last week the Bills have been tied to a trade up, a trade down, Metcalf, Oliver and Jonah Williams. I'm beginning to think no one knows anything. Here's the take of the lead draft analyst from Pro Football Focus: I couldn't disagree more. I had more fun doing this than I thought. I'll happily do 3.0, whatever team is needed. If I could make a suggestion, I think for the last mock draft you should let someone control the Bills rather than doing a community poll. It's all just for fun anyways. Beyond stats, which I don't really care about for college, what are the concerns with Gary? If work ethic is the concern we won't draft him. Is there anything else? He is definitely the Josh Allen of defense this year where everyone outside of NFL scouts want nothing to do with him and I'm wondering why. No single player that we draft or trade for is going go to make our offense at least average. Only Josh Allen improving can do that. I'm not saying we have any elite offensive talent, but what we have should suffice IF Allen does his job. But a single stud pass rusher could make our defense elite. My dream scenario is trade our 2nd rounder for Clark (thank you Bilzfancy for pointing out that this is possible) and draft Oliver at #9 overall. Free agency filled out the offense pretty well IMO. Not to say we should completely ignore it in the draft. I have this hunch that after we pick in the 1st round, Beane will try and trade our 2nd rounder for Frank Clark or Javdeon Clowney. I don't think they want to trade for a player until they know who they get at pick 9. But Beane keeps saying they have the cap space left over to sign another impact player and I don't think he's just making conversation. At pick 54, the Texans select Juan Thornhill, S, Virginia. After losing Tyrann Mathieu in free agency they need a ball hawk safety, and Thornhill fits the mold. At pick 55 the Texans select Julian Love, CB, Notre Dame. Their depleted secondary needs help, and a CB with ball skills is a huge need. @Virgil is on the clock for the Ravens. Here's the conservative road to 10-6: -3-3 in the division (2-0 Dolphins, 1-1 Jets, 0-2 Patriots) -Somewhat easy wins against Giants, Bengals, Titans, Redskins, Broncos, Ravens -Win 1 of Browns, Eagles, Cowboys, Steelers I think that is very doable.